Clothes cabinets can be used anywhere where lockable storage space is needed. They are suitable, for example, for industrial facilities, companies, shops, bureaus, hospitals, schools, gyms, sports halls, swim halls and health clubs. Kaso has manufactured clothes cabinets for over 50 years. Durable and good-looking, Kaso clothes cabinets combine ease of use with safety and stylish design. The cabinets are available with a flat or sloping roof. Air-conditioning and double doors are available on request. Kaso model Z - clothing cabinets are an space-saving solution for locations that have limited space and it is not possible to install regular-sized cabinets. Kaso clothing cabinets can be used anywhere where lockable storage space is needed. They are suitable, for example in industrial plants, companies, shops, bureaus, hospitals, schools and sports halls. There is a wide selection of door materials available including steel plate and laminate. Kaso clothing cabinets are dimensioned according to established laws and regulations. 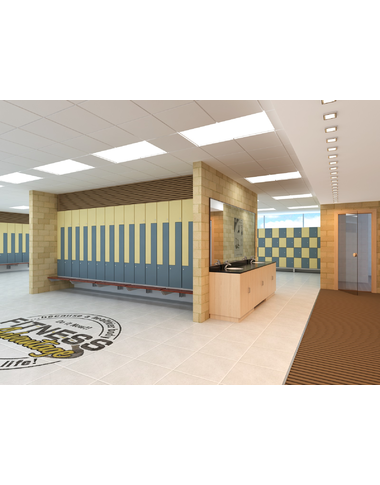 The cabinets conform with the recommendations for locker rooms, washing rooms and closets of permanent working places (RT 94-10053), restroom directions given by the National Board of Labour Protection (30:1, RT TSH-20367) and general restroom directions (Security Instructions 30:0). • Bench constructed from plastic-coated steel or lacquered pine boards.